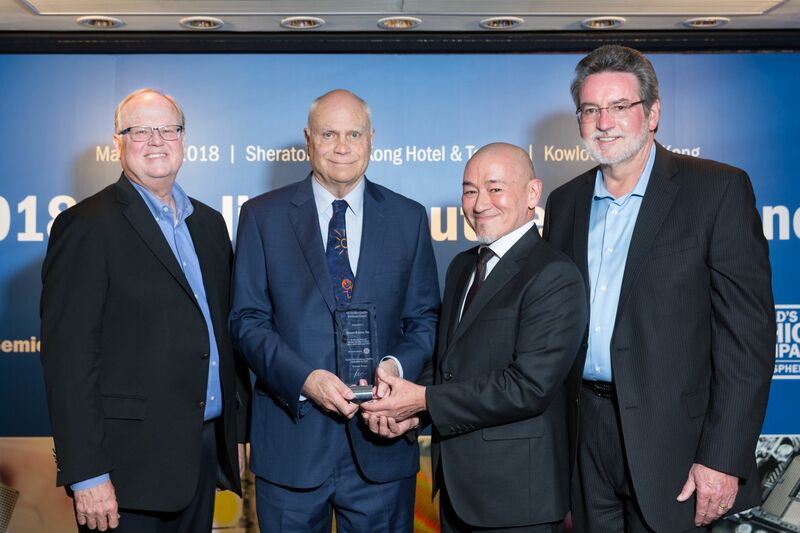 April 5, 2018 – Hong Kong, China – Brewer Science is pleased to announce that the company was selected by ON Semiconductor to receive the prestigious Front End (FE) Perfect Quality Platinum Award. The award was presented to Dr. Terry Brewer, President and Founder of Brewer Science, and Rick Miller, Executive Director, Global Sales, at an awards ceremony on March 27. After evaluating more than 3,000 suppliers for quality, Brewer Science was one of only twenty companies earning recognition from ON Semiconductor. Brewer Science’s focus on helping customers succeed was the catalyst for achieving this recognition. Since 1981, Brewer Science has been recognized globally for its expertise in advanced manufacturing, which has accelerated the timeline for product development. President and Chief Executive Officer of ON Semiconductor, Keith Jackson, and Senior Vice President of Quality, Reliability and Environmental Health and Safety for ON Semiconductor, Keenan Evans, present President and Founder of Brewer Science, Dr. Terry Brewer and Executive Director of Global Sales Operations of Brewer Science, Rick Miller with the Front End (FE) Perfect Quality Platinum Award. Brewer Science is a global technology leader in developing and manufacturing innovative materials and processes for the fabrication of semiconductors and microelectronic devices. With its headquarters in Rolla, Missouri, Brewer Science supports customers throughout the world with a service and distribution network in North America, Europe, and Asia.